Nachips? - corn tortilla chips, 1 Bean and tomato topping salsa. Chilli rating - mild - 1. Preservative free. Suitable for vegetarians. 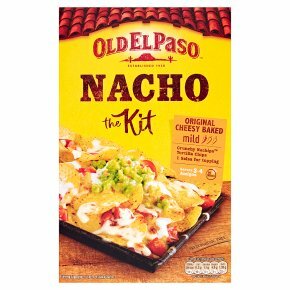 Old El Paso Kits are a great way to create the ultimate Mexican meal experience All Old El Paso Fajita, Enchilada or Burrito Kits are quick and easy - each kit contains wraps, salsa and a seasoning mix Why not try our Old El Paso Smoky BBQ Fajita kit, its a winner for the whole family! Try our delicious Old El Paso Cheesy Baked Enchilada Kit or Beans & Chili Burrito kit!